Hatch chile season is here! These green chiles were named after the Hatch Valley, in New Mexico, where they are exclusively grown. The region, located along the Rio Grande River, provides the perfect growing conditions for cultivating these flavorful chiles: hot summer days and cool nights, ample water for irrigation, and mineral-rich soil. They are only harvested once a year, in late July to early August, and the season last for just six weeks. I must confess that I had never heard of hatch chiles until last week, when Whole Foods started heavily promoting their availability. The long, curvy chile pods were showcased, going ’round and ’round, in a big barrel roaster in front of the store. The wonderful smoky fragrance of the roasting chiles wafted through the parking lot, beckoning customers to come in. To get the full hatch chile experience, I opted to buy them fresh so I could roast them myself and breathe in and enjoy the aroma that would fill my kitchen. I started roasting them on a cast iron skillet, but that was taking too long, so I took them off the pan and put them directly over the flame of the gas burner. I should have done that in the first place. Applying heat to the chiles not only enhances their flavor, but also makes it easier to peel the tough skin from the pod. Once they were charred and blackened all over, I put the hot chiles in a plastic bag, sealing them in to create steam, which helps to remove the skin. After about 10 minutes, the skins rubbed off easily, while keeping the chiles whole. I enjoy discovering new ingredients and thinking about how to cook with them. It stretches my imagination and creativity. Most of the time I cook, I follow a basic recipe, either from a cookbook or from one of my fellow bloggers, but add my own twist. However, these chiles were so inspiring that I didn’t need to find a recipe. I knew exactly what I wanted to do with them. This is a warm, comforting dish with layers of smoky flavors from the chiles, chorizo, paprika, and chipotle powder. Though relatively mild as chiles go, the hatch chiles were at the top of my own range of heat tolerance. The chorizo added richness and a little more heat. This dish is perfect anytime of day. Serve with your favorite green salsa, warm tortillas, and rice and beans for a hearty breakfast, lunch or dinner. Heat a skillet on medium heat and add vegetable oil. Sauté onion and garlic, until softened and fragrant. Add tomatoes and chorizo and cook thoroughly. Use a wooden spoon or spatula to break up the sausage, if needed. Chorizo will not necessarily brown when cooked. Set aside. In a bowl whisk the eggs and then add the milk, salt, pepper, paprika, and chipotle powder and set aside. Cut the hatch chiles in half lengthwise and place half of them in a single layer on the bottom of an 8″ x 8″ baking dish (My 7 1/2″ oven-safe fry pan worked great for me). Add half of the chorizo in an even layer on top of the chiles. Sprinkle 1/2 cup of shredded cheese evenly on top of the chorizo. 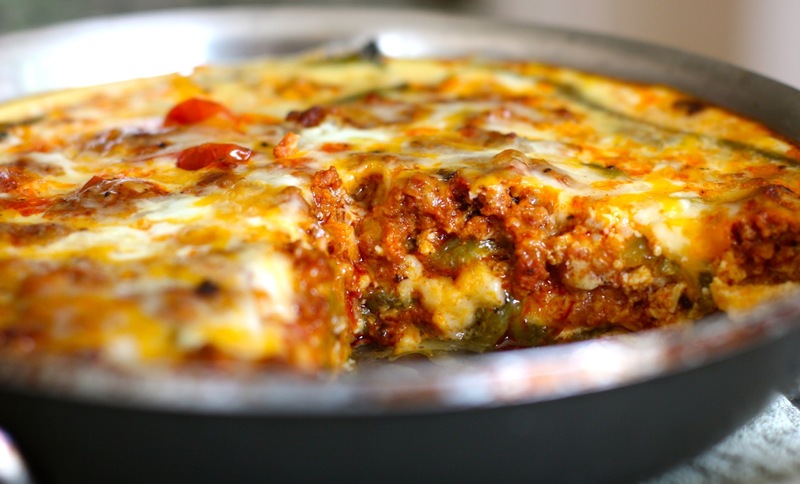 Repeat by adding another layer of chiles, chorizo, and cheese. Pour the egg/milk mixture over the top of the chiles, chorizo and cheese. Bake for 25 to 30 minutes, or until the eggs are set. I bought Hatch peppers earlier this year and thought yeaterday that they would be good with sausage. I found your recipe and it was wonderful. My coworker and I both enjoyed it so much. I loved this dish! I put it together sans egg mixture on Saturday so we could have an effortless dinner Monday. The one putting it the oven forgot to top combine the egg and milk and spice mixture which I had already measured. Even without the egg it was delicious! Also, I used soy chorizo from Trader Joe’s. Hatch peppers freeze beautifully. Stock up while you can! I am behind in reading blog posts. I definitely have to check out your pasta with the hatch chiles. I can hardly wait to try this recipe! 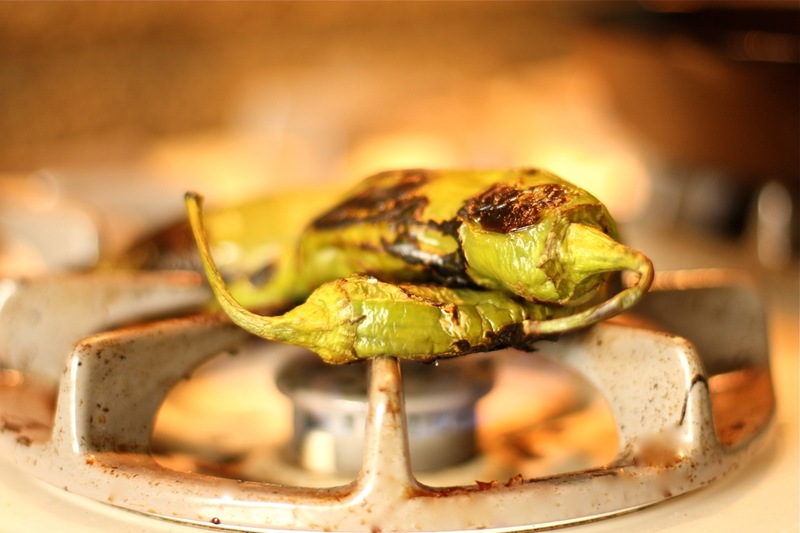 I live in southern Arizona and roasted Hatch chiles are abundant right now… they roast/sell them in front of grocery stores and roadside stands everywhere. I will definitely report back after I try it this week. Thank you so much! Hi, Pat! First off, thanks for visiting my blog. I hope you enjoy reading my posts. Aren’t hatch chiles so good? Like I said, I’d never heard of them before, but I’m a huge fan now! 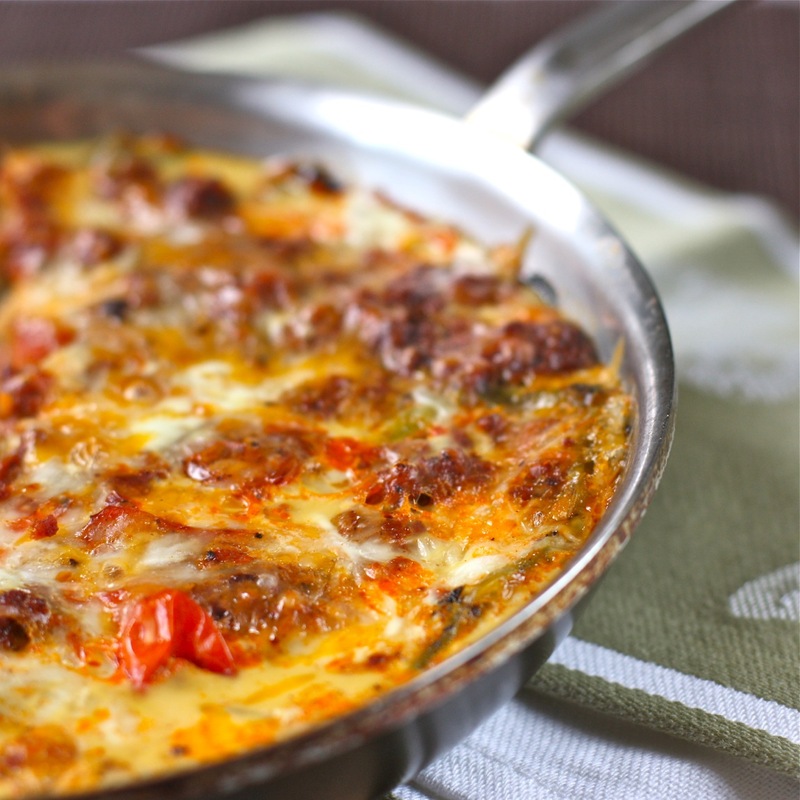 If you’re also a fan of Mexican-style chorizo, I think you’ll enjoy this dish. Please do report back. Wow, this looks absolutely delicious. Great recipe. I can’t wait to try this out. Don’t have the Hatch Chiles here on Guam but I do have regular Anaheim. They will have to do. Thanks, Rueben! Welcome to my blog. I’m sure Anaheim or maybe pasilla chiles would work. I have never heard of them either, but now I want to try! This is food to enjoy with a frosty beer. The season is short, Susan! Maybe your US friends can procure some for you. I’ve never heard of hatch chiles either! This looks fabulous. Loooove chorizo. I love chorizo, too. Although I really like the cured Spanish chorizo, I love the Mexican-style chorizo, especially with eggs. in the morning ,whit tortillas ..Yum!!!!! Yes, exactly! Warm, a bit spicy, and so filling!